Back when I was on holiday in Cornwall I visited the Eden Project and took these photos of shamanic art high on the walls of the Rainforest Biome. I meant to blog about them at the time, but ended up with so many other things to share that these got put to one side. I am posting them now as part of my week looking at holiday memories. 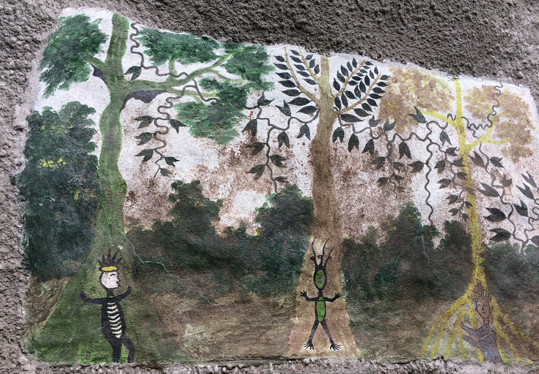 The murals are the work of Peruvian shamanic artists Montes Shuna and Panduro Baneo. They show plant healers and visions of the spirits of these plants they have worked with medicinally. 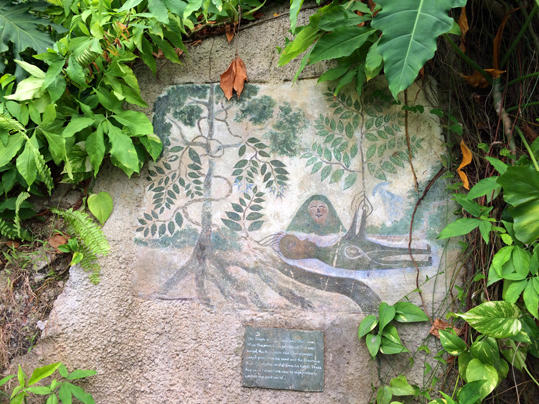 There are a whole series of mural and each one shows a different aspect of the spiritual connection between plants and people. When the powerful vegetalista Ayas was buried, the ayahuasca vine (Banisteriopsis caapi) grew from his head and the chacruna bush (Psychotria viridis) from his hands; the two key ingredients of ayahuasca were discovered. Ayahuasca is used by the vegetalistas to contact the spirit world. The canelilla (Aniba canelilla) and huambisa chacruna (Diplopterys cabrerana) are depicted here, purifying the body. The body is covered with yellow clay, also used in spiritual purification. Look closely to find male and female energy in the painting. Three great teacher trees, catahua (Hura crepitans), lupuna colorada (Canavillesia arborea) and chullachaqui caspi (Remijia sp.) with their spirits. Teacher trees provide spiritual guidance and medicinal properties. Look out for teacher trees as you continue your journey. 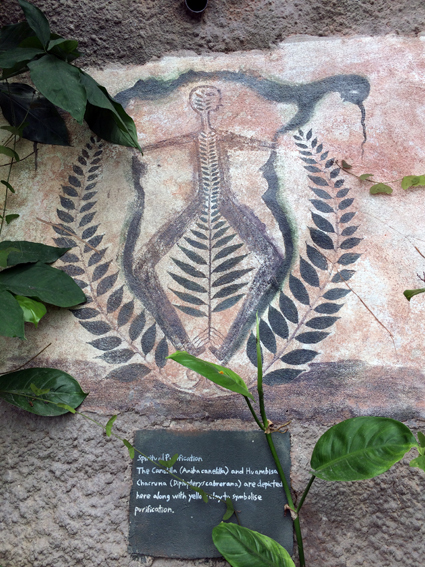 Also at the Eden Project there are several other murals showing different plants or aspects of shamanic practises. Do look out for them if you visit.